This is the backshop of DeadlineNews.Com, where news really hits home! 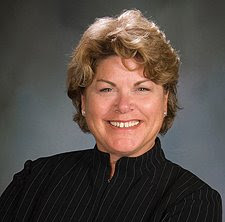 We recently sat down in a question-and-answer session with Julia Truesdale Keady, 2009 President of the Silicon Valley Association of Realtors (SILVAR), to glean advice for homeowners, home buyers and home sellers in Silicon Valley. See more Deadline Newsroom Q&As with real estate leaders. Deadline Newsroom - Uncertainty in the housing market makes it a good time to seek insight from real estate professionals, leaders who have their fingers on the pulse of the housing market. Keady is also a Realtor with Alain Pinel Realtors in Palo Alto and has been an active, top-producing real estate agent on the San Francisco Mid-Peninsula since 1985. She's married to Michael Morris and together share a full house of children -- Ashley, Daniel, Kate and James -- and two grandchildren, Kierra and Danny. In Keady's spare time she travels, and enjoys golf, hockey, hiking and opera. She also has her hands full leading SILVAR. SILVAR is a professional trade organization representing more than 4,000 Realtors and affiliate members engaged in real estate business on the San Francisco Peninsula and in the South San Francisco Bay Area. SILVAR promotes ethical standards in real estate practice and serves as an advocate for homeownership and homeowners, while representing the interests property owners in Silicon Valley. SILVAR members are also members of the National Association of Realtors and the California Association of Realtors. Q: What is your role as president of SILVAR? A: My role to ensure our members have a competitive advantage in the market. Working with SILVAR's board of directors, I am committed to maintaining the level and quality of services for our members, and to provide the tools necessary to help our members survive and succeed in business. Tools include business meetings, educational programs, marketing opportunities and access to current market trend reports. Q: The housing crisis is on the minds of everyone, especially home owners who are struggling to pay their mortgages. What steps are you, in your role as president, and SILVAR taking to help at-risk homeowners keep their homes? A: We are educating our members about property issues. Our government affairs staff keeps an eye on proposals at the local, state, national government levels that might significantly impact home ownership, private property rights and housing opportunities. At the national level, we are working with the National Association of Realtors (NAR) to preserve the mortgage interest deduction, tax credits for first-time homebuyers and higher conforming loan limits. At the state level, we oppose mandates on the sale of homes that would ultimately result in increasing the cost of buying a home. We also support the expansion of diversified housing opportunities for families of all income levels in Silicon Valley. Q: What advice do you have for homeowners, in general, in terms of maintaining the value of their homes in a tight market? For those who choose to stay put right now, what might they be overlooking in terms of retaining and maintaining their home as a valuable asset? A: Good home maintenance is key to preserving a home's value, and impressing potential buyers. Making homes safe with smoke detectors and carbon monoxide detectors, keeping the electrical system and plumbing in good working order are important steps. Routine preventive maintenance is also important. Repair roof leaks, seal gaps in siding, paint bare wood, replace damaged decking, patch cracks in concrete, and caulk around tubs and showers. Also important: a programmable thermostat, weather stripping for doors and windows, fixing leaking faucets, upgrading insulation, and replacing leaky windows. Home owners should also consider environmentally-friendly materials for windows, doors, siding, decking, fencing, roofing, flooring, and insulation. And always get rid of clutter, open up spaces, update window treatments to allow in more light, and organize closets and storage. Q: What advice do you have for home buyers in the current market? Some buyers have decided to sit out the recession and wait for the bottom of the market. Other buyers have decided to buy now because prices have already dropped and mortgage rates are low. What advice do you have for each type of buyer? A: If you have a solid job and you can afford to buy a home, now is an ideal time. Recent decreases in home prices and mortgage rates have brought affordability into better alignment with income levels. Inventory is up, which means buyers have more homes from which to choose, and with that comes more negotiating power. Interest rates and state and federal incentive programs out there for buyers are the best I have seen in my long career. There are some (job-loss mortgage insurance) programs in our marketplace today that will protect a first-time buyer's mortgage payment for some months in the event buyer loses their job in the first year of home ownership. Even if the market were to lose some value from here, if the interest rates bump up even a small percent, the long-term cost of a home purchased later would be greater than buying today at our current rates. Real estate has always been considered a long-term investment. Homeownership builds wealth over the long-term. Make sure you consult a professional, experienced Realtor, who is knowledgeable about market conditions in your area. Q: Likewise, what advice do you have for home sellers, some of whom have decided to wait until the market improves and others who, for one reason or another, must sell now? How can they best approach their decision to sell or not to sell? A: If you want to sell, seek advice from an honest, competent, and experienced Realtor about why you are thinking about selling. Write down all the positive and negative reasons. One list will stand out and your decision will be easy. If you decide to sell, price your home correctly. Seek the help of a Realtor to evaluate a realistic market value for your property. Do not price your home only to test the waters. Today, under present market conditions, real market pricing is key to selling your home right away. If you set your price unrealistically and are forced into a price reduction, you will ultimately be chasing water downhill. Your Realtor can give you recommendations as to how to make your home look and feel like the home buyers seek in your neighborhood. Q: What can you tell residents in Silicon Valley about the current state of the housing market? The median price in March, $450,000 for single-family homes, was less than it was nearly 10 years ago in March 2000, at $524,250. The March median this year was also about half the median price of $830,000 in March 2007, the year the market peaked. How did that happen? How does that pan out for home values? Have homes lost half their value in just a couple of years? A: This is very discouraging at first glance. While all areas have felt the recessionary impact of lower home values, some areas have been hit particularly harder than others. The drop in median price overstates the decline in the value of the typical Silicon Valley home. At present, the median home price is reflecting the fact that more of the lower-end, discounted homes are selling in this market, so there is a softening of high-end sales, which are now under-represented in the statistics. The housing market can differ from one street to the next, depending upon the school district and other assets of a neighborhood. To know what effect the current economic climate has had on a given property, residents should consult with a Realtor to obtain an evaluation of that property. Don't forget, homeownership is a long-term investment and a good one. According to the Federal Reserve Board, a homeowner's net worth is 46 times that of a renter's. When purchased for the long-term, housing is still one of the safest investments consumers can make. In addition to the savings accumulated through a buildup of equity and tax advantages, a home provides shelter. No paper investment provides this benefit. Also, the benefits of home ownership go beyond the checkbook or 1040 forms. Studies show high and stable rates of home ownership rates boost the quality of life in communities by supporting education and civic involvement, while lowering crime rates and welfare dependency. Q: Is it a buyer's or seller's market? Why? When will the market return to a "normal" market that's fair and balanced for both buyers and sellers? A: Actually, "fair and balanced" describes the current marketplace. If priced realistically, homes sell. Sellers may not now enjoy the value they had in 2007, but their home will sell if priced realistically. Bargain hunters are more likely to find a good deal when the supply is ample, like now. Buyers can take their time and buy subject to the sale of their current home more easily than in recent years. That puts buyers in a better position to negotiate than they were a couple of years ago. With interest rates so low and these other great incentives, including the tax advantage of the mortgage interest deduction, now is a perfect time for first-time and even repeat buyers. Q: Are there any additional comments you'd like to share with your constituency, consumers or the public at large? A: Times are tough, sure, but we are very fortunate here in the Silicon Valley region. We still have more jobs than housing units and it is a wonderful and vibrant place to live. Our employment diversity, fabulous educational institutions, world renowned healthcare and exceptional weather are golden and we will be a desirable place to live forever. People buy homes here to live in and pay off so, in their golden years, they will have an asset that will help support them throughout their lives. Investment opportunities also abound. Rental property purchased and held for the long term is a very tried and true strategy employed by many. I would urge consumers who are considering selling or buying a home to contact a Realtor in their local market. A Realtor can help them begin to build their future through homeownership. A Realtor and affiliates can help you with home inspections, home financing, home buyer and home selling. Visit SILVAR's Web site to contact a Realtor.  Click on the keywords below for more stories on this subject. Need a break from doom and gloom in the housing market? Get off the beaten news track and stop by the DeadlineNews Group's Offbeat News Examiner outlet for a few laughs. Get news that really hits home for your Web site or blog from DeadlineNews.Com. Broderick Perkins, an award-winning consumer journalist, parlayed 30 years of old-school journalism into a digital real estate news service, the San Jose, CA-based DeadlineNews Group, including DeadlineNews.Com, a real estate news and consulting service and Web site, and the Deadline Newsroom, DeadlineNews.Com's news back shop. Perkins is also a National Real Estate Examiner. All the news that really hits home from three locations -- that's location, location, location!  Click to get more rates.  Click to get this Erate.com widget. Get the inside on the news that really hits home. If you don't get it here, well, you just don't get it...and neither do your clients. DeadlineNews.Com's editorial content is available for purchase, but it remains our intellectual property. Unauthorized use is a federal crime.